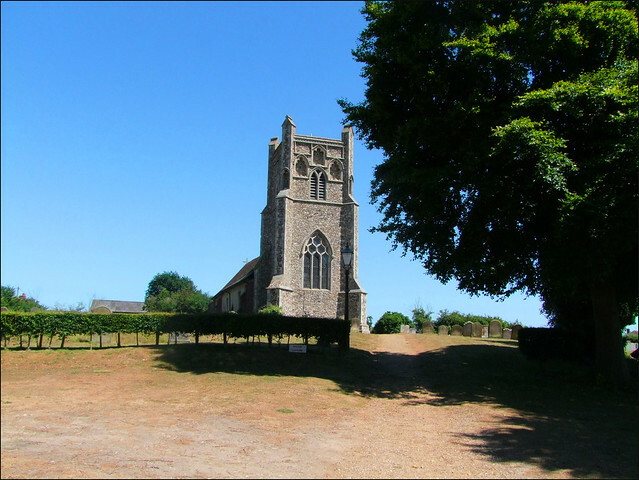 It was the hottest day of the year so far, and I was nearing the end of a meandering bicycle tour of the north and east of Suffolk. The train at Saxmundham was an hour off, but I headed south again, from the Saxmundham to Leiston road, under the vast chain of power lines that links the Sizewell nuclear power station with the rest of the country. I recalled vividly coming this way a little short of ten years previously. On that occasion, on a darkening afternoon in late November, I had cut a swathe along roads which ran like streams. All around was water, after the wettest autumn for 250 years. The power lines sizzled and cracked as I threaded through the pylons and beneath them, the sound of 10,000 quintillion volts of nuclear-generated electricity urgently seeking the shortest possible path to the ground. This concentrated my mind somewhat, as you may imagine. It seemed strange to be back here in a dry month, and it took me a moment to recognise the lane up to the church, in its huddle of houses with the curiously urban hall opposite. It must be said that the tower of St Mary is rather striking. The tower seems to be a Victorian rebuild, and quite a late one. Mortlock generously considers that it is an exact copy of what was there before. In all honestly, I would find this doubtful, if it were not for the fact that the architect was Edward Bishopp, a man not best remembered for his creative imagination. The most striking features are the niches; one in each buttress, and a possible rood group above the west window. This is a bit like the same at Parham and Cotton, and the buttresses like those at Wetheringsett, so they may be original, or perhaps just based on those other churches. The body of the church must be Norman originally, judging by the blocked north door, but there are so many late Perpendicular windows, I wonder if it wasn't entirely rebuilt retaining the doorway sometime in the early 16th century. When I had last come this way St Mary was kept locked, but today it is an open church, an evocative and intimate space which you step down into, to be confronted by the Parish of Friston's most famous possession. This is the massive James I coat of arms. It is fully eight feet wide and six feet high, carved from boards six inches thick. The story goes that it was found in pieces in the belfry by Munro Cautley, during his trawl of Suffolk churches in the 1930s. In his capacity as Diocesan architect, he insisted that the churchwardens repair it, and restore it to its rightful place. Since the chancel tympanum where it had hung had been removed by the Victorians, this presented the churchwardens with an interesting problem. So, they solved it by attaching the arms to the north wall of the nave, level with the tops of the pews, where it remains. it is not in great condition, but it is rather extraordinary to be able to see it at such close quarters. The nave is long and narrow, under an arch-bracedroof. The 19th century font stands on an upturned medieval one as its pedestal, with a rather good early 20th century font cover. At the other end of the church is something rather remarkable, a completely unspoiled Victorian chancel. So many of these have been whitewashed in the last fifty years or so, but this is utterly charming, the walls painted and stencilled in pastel shades, and an ornate text running around the top of the walls. The finishing touch is the risen Christ flanked by Mary and John in the east window. Mortlock could not discover the name of the artist, but it is very much in the style of the Powell workshop. A memorial board reminds the parishioners of Friston that In the Year of Our Lord one thousand eight hundred and eleven, the Reverend John Lambert bequeathed to the parish the sum of two hundred pounds, to be placed in the 3£ per cent consols, and the interest thereof to be distributed by the churchwardens every Christmas ___ for ever: to poor Housekeepers who should not for twelve months preceding have received Pay of the Parish. The word Day or Eve has been eradicated at some point, possibly for theological reasons, possibly because of the difficulty of getting to the bank in Saxmundham on a public holiday. Two hundred pounds was a fairly large amount of money in 1811, roughly equivalent to forty thousand pounds today, and for ever must have seemed an enticing prospect. However, consols were effectively bonds, their value remaining the same but offering a guaranteed return (in this case three per cent) based on the perceived annual growth in the economy. Like endowment mortgages, they would turn out to be a fairly short-sighted enthusiasm. The safe return from consols came to an end as a result of the great depression of the 1870s and 1880s, and inflation thereafter reduced such holdings to almost nothing. The Reverend Lambert would have been better off investing in land or gold; but such is the gift of hindsight, of course.